The vast world of the internet that our children live in – what a place! There’s so much to explore and endless opportunities to learn something new. With that said, the internet does present a challenge for parents as their children want to be where their friends are. The internet includes many areas to cover so for this post I’ll focus on high level tips and more specific subjects will follow. Here are 5 tips to consider when your children are navigating the internet. Most home router’s today will have a timed access feature where you can limit time for individually connected devices. Many activities (games, messaging apps, YouTube, etc.) on mobile devices require internet so this is an easy way to limit their time for many activities they’ll do on their device. For young children with smartphones, a recommendation is to have no data on your child’s device so they’ll require a wifi connection (you can still get unlimited texting plans as let’s face it, this is how they communicate nowadays, plus it saves you a couple of bucks!). Do your best to not allow these devices in their rooms – especially overnight. Have a charging station that’s central in your home and enforce that all devices are put there every day. I found this great article that urges parents to not have any screens in their children’s bedrooms whatsoever (ie: our kids don’t have a TV). This extends to other devices too: TVs, Game Consoles, PSPs/Nintendo 3DS, etc. This has to be the app that my children spend the most time on. From life hackers to sports highlights to latest pop music videos or how to build the next mega castle with hidden rooms in Minecraft (and many more). 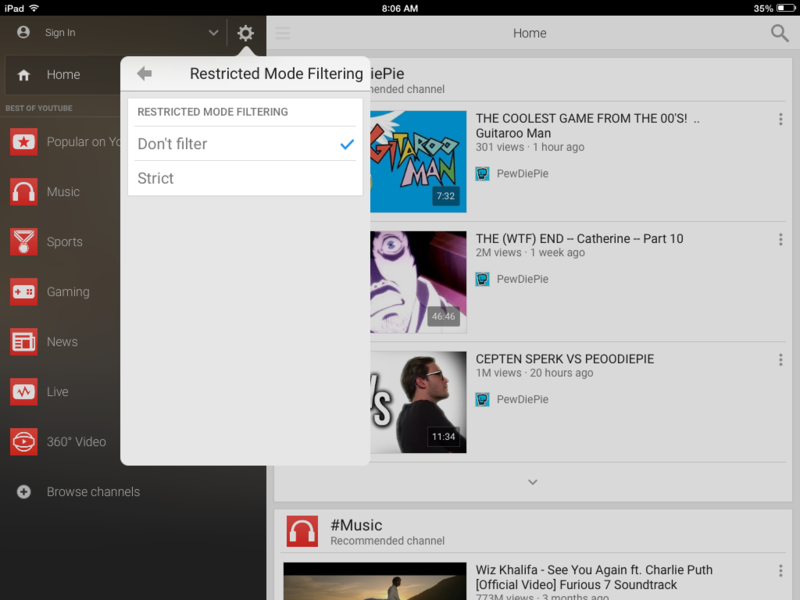 YouTube has a feature that you can enforce within the app to filter out inappropriate content. Enabling “Restricted mode” under the YouTube app settings will not show content that may be deemed inappropriate. Obviously no filter is perfect but this is a great way to filter the majority of what your child may come across in the related videos (typical culprit of “innocent taping”) or if they try to actually search for inappropriate videos. The only catch is currently unless you use a parental control app, the setting can be reset. Read more about how to set it up on other devices and browsers here. YouTube Android app Restricted Mode settings. Practice being open about your child’s web history. All modern day web browsers track history and allow the user to delete it. Be clear that you will review it from time to time and by deleting any history they would be breaking trust with the use of their device – they should have nothing to hide. The use of a safe browser that allows for filtering of inappropriate content categories can also help with the chance that your child goes to a site or is told to try a “cool” site that is inappropriate. Again, no single filter in 100% accurate but many safe browsers exist in app stores today that are not very expensive and provide some filtering. The key on mobile devices is to enforce that they only use this browser as the default – with younger children this is possible for a while but most will be able to get around this so a third party parental control application can also be considered to enforce this. 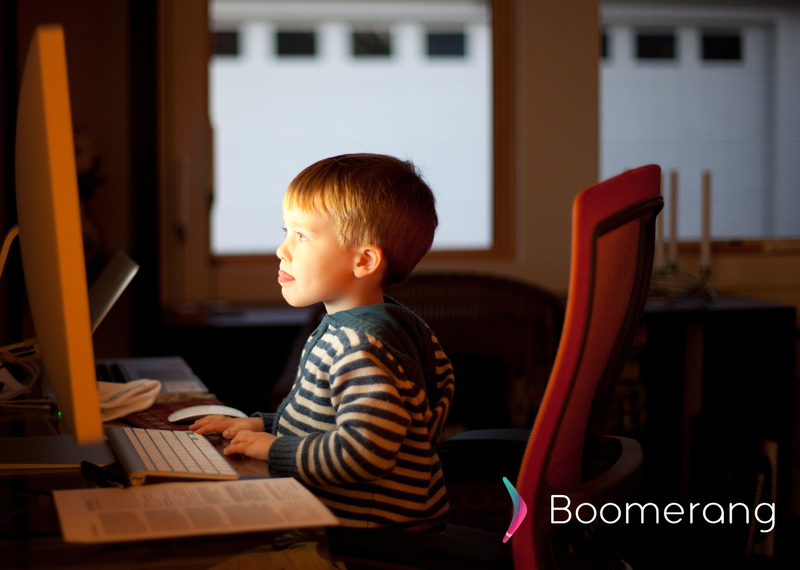 Bonus: did you know that when you use Boomerang, we install our own browser that leverages the web filtering capabilities of Boomerang? Both iOS and Android app stores allow some age restrictions. On iOS devices, you can access this feature under the Restrictions area and for Android devices you can created a Restricted User on their device. We discussed both of these features here. Another tip is to not provide a credit card on your child’s device so they end up costing you a lot on in-app purchases. Leverage gift cards that have set limits on their spending. This covers off some of the high level areas for now. More specific posts on cyberbullying, social media networks. messaging apps and more is all being drafted.